We welcome all participants to Florida State University’s campus in Tallahassee! The venue for our Symposium will be the Robert Bradley Reading Room of Strozier Library, on Landis Green — designated “Strozier Library (LIB)” on the interactive campus map (area 6 on the campus accessibility map). The registration table will be just inside Strozier’s front doors, and your event badge will serve as your credentials to pass through the turnstiles. Once inside the library turnstiles, turn right at the information desk to find the main stairwell; the Bradley Reading Room is located downstairs, on the lower level of the library. Florida State University is accessible via I-10, located a few miles off of exits 199 and 203, or directly accessible via US Route 90 (Tennessee Street). Turn Left (south) onto Stadium Dr.
Once US-90 becomes W Tennessee St., head south onto Stadium Dr. The designated visitors’ lot is best accessed via Stadium Drive. Visitors are encouraged to check the FSU Visitors Center page for updates regarding any construction. Click for IWDH Google Map including parking hacks, walking routes, and one pub. Florida State University offers several options for visitor parking, including a designated visitors’ lot at the University Center, which is located near the Doak Campbell football stadium between Champions Way and Stadium Drive. Parking in this lot costs $1 per hour, or $5 per day, and visitors should allow approximately 15-20 minutes to walk to Strozier Library from this location. 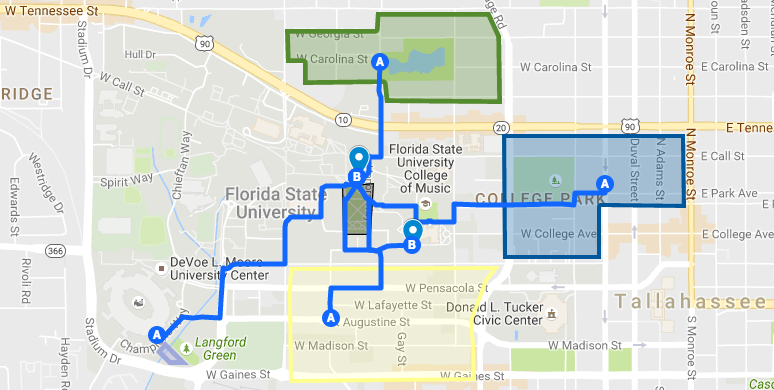 (One pleasant walking route follows Champions to W. Pensacola to S. Woodward to Traditions Way, where you will find Strozier Library at the end of Collegiate Loop). The Garnet and Gold Lines of the Seminole Express Bus Service can also deliver you from the University Center to Strozier Library free of charge. Again, however, allow 15-20 minutes. Alternatively, visitors may choose to purchase online a daily visitor’s permit for $3.25 per day, allowing them to park in any open and ungated faculty/staff lot designated “A,” or in any student spot on campus. While there are many “A” lots across campus, not all of them are open and ungated. Also, at certain times of the day, student spots are full, so we encourage visitors to either allow themselves extra time to discover these lots, or to park at the University Center for convenience. Tallahassee is served by its own municipal airport, with connecting flights several times daily to/from Atlanta, GA and Charlotte, NC, as well as some direct flights to/from Dallas-Ft. Worth, Orlando, and Miami. The airport is conveniently located 10 miles from FSU’s campus, and visitors can find a bank of available taxis always waiting outside the baggage claim area. Taxi fare ranges from $20 to $30 into downtown. Advanced reservations can also be made with some of the area’s other shuttle services, and rental cars can be arranged at the airport. Several area hotels offer free shuttle service to and from the airport. See the Airport’s Ground Transportation page for more details. Graduate students in need of alternative lodging options should feel free to contact the Symposium organizers. The Call for Papers has been issued for the special issue of Digital Humanities Quarterly on Invisible Work in the Digital Humanities.